Acer on Monday shipped its Aspire S3 ultrabook starting at $899, becoming the first to crack the $1,000 price barrier in Intel’s new category of thin and light laptops. The S3 has a 13.3-inch screen, is 0.51 inches (1.30 centimeters) thick and weighs 2.98 pounds (1.35 kilograms). It has an Intel Core i5 processor, a 20GB solid-state drive and a 320GB hard drive. Ultrabooks are being promoted by Intel Corp. as a new category of laptops with “tablet-like” features. 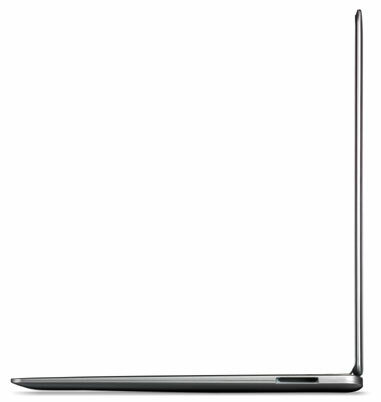 Some resemble Apple’s MacBook Air but are slightly thinner and lighter. The ultrabook is a way for Intel to renew consumer interest in laptops, whose shipments have been challenged by tablets like Apple’s iPad. Ultrabooks are also shipping from Lenovo and Toshiba, but analysts said ultrabooks selling for more than US$1,000 are not viable in today’s price-sensitive market. Acer may have cracked that price point by using a hard disk drive for the primary storage, which is cheaper than an SSD. Models with SSDs for primary storage will be available in the future, an Acer spokeswoman said. The laptop can run for up to six hours on a single charge, and have close to 50 days of standby power, according to the company. Ultrabooks are not meant to replace netbooks or other low-cost laptops, Intel has said. But the chipmaker hopes they’ll account for nearly 40 percent of the consumer laptops sold by the end of next year. It expects PC makers to roll out more advanced ultrabooks with touchscreens, all-day batteries and instant-boot capabilities over the next few years. The current crop of ultrabooks use Intel’s Core microprocessors based on the Sandy Bridge microarchitecture. In the first half of next year, Intel will release faster and more power-efficient chips code-named Ivy Bridge for ultrabooks.